Home » Archive by Category "Carpet & Rug"
Carpets play an important role in enhancing the ambiance of where ever they are placed. They have always been a symbol of tradition, culture, art and history. With the recent advancements in furniture and architecture, the rugs have completely evolved as well. But, in order to stay close to one’s heritage and ancestors, traditional carpets are no less than any jewel. India has a history of traditional carpet making and holds a record 35% shares of handmade carpets and 90% of the machine made. The carpets are unique as the intricate designs and patterns threaded onto these unique pieces are not only historical but also shows the cultural legacy of the region as well. If you are looking for buying a hand-made carpet then, Miras Carpet Industries is the best choice in India. Recent reports have indicated that the carpet business has been facing a downfall due to the emergence of new and modern rugs available in the marts and famous shopping stores. The machine-made carpets have greatly caused a decline in the selling of hand made crafted rugs and carpets in the country. This has resulted in the fading away of not only just the tradition but also has taken away the earnings of the carpet weavers. The hand-made carpets are a representation of a craftsmen skills and struggles. The blood, sweat and tears which they put into their work is unmatchable as compared to the machinery. These middle people which carpet manufacturers hire need help and a consistent source of earning for which Miras Crafts is aiming to increase its manpower. It is an online business and trade house which was established by the founders Mr. Mir Nawaz and Mr. Mir Waseem in 1983 in Bangalore, India. The craft house has its origin from Kashmir and its factory is located in Lalbazar, Srinagar. Apart from Bangalore and Kashmir, the company has its dealers and suppliers in Delhi and Mumbai as well. This carpet manufacturers has an established business of handmade rugs, shawls, pashmina and cashmere stoles and jewelry. Moreover, this carpet manufacturer and seller based in Bangalore are the only carpet dealers and sellers who have won the best expo awards in the realm of carpet industry. Certified by the Carpet Export Promotion Council of India (CEPC) and Importers and Exporters by Director General of Foreign Trades, India, this Kashmiri and pashmina carpet store in Bangalore deals with commercial as well as domestic carpets and also offers the facility of customized items according to the demands of the clients. handmade carpets, hand knotted carpets, kashmiri carpet. The main mission of the company headed by Mr. Mir is to preserve the local heritage of the region and promote awareness about the importance of the hard work done by the local craftsmen among the young generation of the country who is drifting away from the historical heritage and architecture of the country. Our main targets are the local customers, hotels and IT in Bangalore. In order to increase the man power, we are aiming to create 20,000 to 30,000 jobs in the next fiscal year. Services at Miras Carpet Industries. The Miras Carpet industries offer its services even after the purchasing of the items such as washing, cleaning, dusting and restoration of the carpets and rugs. The online services provide all the details about the design, price and information about the items. Contrary to popular belief, the fringes and edges of a handmade rug are not for decorative purposes. They are the extensions of the weft (horizontal lines) and warp (vertical lines) that form the rug’s foundation. The weft and warp are made from cotton, wool, silk or even jute, and if pulled, torn or damaged, will unravel the woven pile (knots) of the rug. Unfortunately, fringes are often the first part of the rug to get torn and damaged. 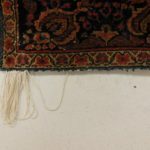 Routine maintenance, as well as being diligent about handling minor repairs, will not only protect the rug, but also prevent further unraveling and more costly repairs. 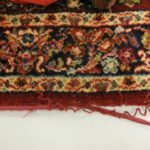 The extent of a rug’s damage, the type of rug it is, and the rug’s foundation fiber will determine how much repair work is required for the rug’s fringe. 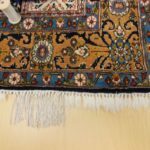 Securing the fringes with proper overcast stitches, implanting new fringes, re-weaving rows of damaged piles (missing nap), and making new fringes are all various options that can bring your rug back to its original condition. Below are the stages of a rug’s fringe implant process. Keeping the border design intact, fringes were implanted, and secured. The fringe repair below shows implants added at the knots of the tassels, while secured properly to prevent the original fringes from unraveling. Below: An unraveled edge is repaired after both the appropriate wool and color match are chosen. Rug repair is a craft and learned skill. It also requires rug knowledge and integrity. Yes, integrity. Most people may not know if the foundation of their rug is cotton, silk or wool. They rely on their rug cleaner to tell them. Although a majority of handmade rugs have cotton foundations, a small percentage of rugs are wool on wool. Then, there are expensive, natural, 100% silk rugs with silk foundations. We have also seen some art-silk rugs with cotton foundations (made mostly in India and China.) If you have an expensive natural silk rug, you do not want to see the fringes repaired with art-silk. Do you want to deal with someone who will charge you for real silk, and then give you faux silk? You must be careful to whom you give your business. Fringe repair cannot be just cosmetic, or a façade hiding the unravelling foundation of a rug. Improper repairs will lead to further issues down the road. We always recommend a handmade rug be repaired to its original condition. However, fringes can be cumbersome to manage, and costly to implant at times. Remember though, the value of your rug for resale, or insurance purposes may be somewhat compromised by the choices you make. – Remove the fringes, secure the ends, and hand weave the edge. – Tuck/fold the fringes, then cover them with a machine made fringe. – Secure and shorten the fringes for ease of maintenance. Ready to Repair Your Carpet Fringe? 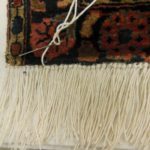 If you own an antique rug, a 100% silk rug or a family heirloom, we suggest investing the time and money to restore your rug’s original fringes. Call us at +91 80 4157 1894 MIRAS CARPET or fill out our contact form here to properly clean and repair the fringes of your handmade rugs. We undertake cleaning of all types of Carpets and Rugs, whatever makeup, size, origin or condition. Kashmiri, Persian, Afghani, Turkish, Pakistani etc. Our team is skilled in cleaning Wool, Silk, Wool and Silk blends, cotton and synthetic carpets and Rugs. We only use top quality detergent based or organic products for our cleaning services. We guarantee the removal of extensive, stubborn build-up of dirt and soil in your carpets and rugs. We use eco-friendly products in our cleaning methods. You can trust Miras Carpet Industries for all your Carpet and Rug cleaning requirements as we have over 35 years of experience, and offer the most comprehensive Oriental Carpet cleaning and Restoration service in Bangaluru India. 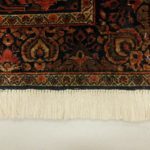 We are specialize in the cleaning of handmade Carpets and Rugs from India, Persia (Iran), Turkey,Pakistan or from any other Tribal region in the world. And these could be new, antique or semi-antique , no matter what kind, we will do the job. Usually we clean Carpets and Rug in 7 to 10 days time depending on the quantity, sizes, condition and weather. Moreover we do all this at most reasonable and realistic prices. We are experienced at dealing with the many kinds of problems your carpets may have encountered. To achieve perfect and safe cleaning results, your carpets will be tested for color fastness before we wash them. If your carpet fails the test, and the colors are likely to bleed, then we will use special methods like dry cleaning. Before we start the process we will check to see if there are areas on the carpet that is more soiled, or if there are any stains on the carpet. If so, we pre-treat these areas and inform you about the process. We are experts at removing stains, using many different special products, but please understand that not all stains can be removed, as they may have permanently changed the colors of the fabric, particularly in Wool Carpets and Rugs. First, as much dust as possible is removed from the carpets, by putting them through a special carpet duster. Then the carpets are washed by hand, and depending on the type, completely submersed and soaked in water. Depending on material and condition, all carpets are cleaned using different products. The carpets are then rinsed carefully front and back. After this thorough cleaning, the carpets are put through a special roller wringer, which gives them a final rinse and removes as much water as possible, in order to facilitate the drying process. The carpets are then hung to dry in a warehouse drying room. All the products are work of art and are entirely hand-made handcrafted product of Kashmir, India that has been painstakingly created using the finest handpicked natural fibers and dyes. As you are already are aware that this is indeed a lifetime purchase, nonetheless it is in your hands to ensure that it is certainly so and can thus become a treasured and precious part of your family heirloom that can be cherished for years to come. To be dry-cleaned or steam cleaned or hand washed only. Use only cold or lukewarm water and carpet shampoo for scrubbing with the help of a cotton swab or a sponge. Do not use strong detergents or solutions with concentrated alkaline contents. Avoid drenching the entire carpet and dry the back of the carpet first if and when soaked. Please Vacuum or Hoover the carpet along with the pile of the carpet and never against the pile (i.e. only in one direction). As the carpets are Moth proof hence do not use any naphthalene balls or anything similar for storage purposes. The best way to keep a rug clean and long lasting is to keep it from getting dirty. Removing your outdoor shoes when you enter the house is an easy way to add years to the life of your rug, and to decrease the expense of professional cleanings. Bare foot, clean slipper or sock footed traffic is much kinder to your rug than hard soled or high-heeled shoes. Leaving your outdoor shoes at the entrance to you home tracks in much less dirt. Having several pairs of clean cotton slippers in different sizes for your guests will encourage visitors to relax and feel at home while protecting your carpets. In stock items normally ship within 24×48 hours after an order has been placed. If you order by credit card your card will be charged as each item is shipped. We will accept cancellation of your order for items that have not shipped or that are on backorder. Once an item has shipped, cancellation is not possible. Custom and special order items cannot be cancelled. Factories or locally referred as Karkhana’s were soon started by the King which led to a flourishing industry in the field of carpet weaving in the valley of Kashmir. But however after the period of King Badshah there was a major setback in this field only to be revived later during the rule of the Mughal Emperor Jehangir.It was the great Saint Akhun Mulla Rahnuma of the Mughal period who played a major role in reviving the Carpet weaving industry with the help of the then Governor of Kashmir during 1600. Once again there was a dip in the industry at the time of the Afghan and the Sikh rule during which there was a big crisis in all the field of Craft. The mid of the 18th century witnessed an unexpected growth in the carpet industry with an increased quality and quantity. It was during the mid 18th century that the beautiful mughal Carpets from Kashmir were displayed at the Crystal Palace exhibition in London and was very much appreciated by the Europeans and slowly the Kashmiris started to cater according to the need of the Western culture. There was once again a setback in the Carpet industry at the time of world recession in 1902. Also the partition of India affected the market for the Carpets both at national and international level. Only during the late 20th century the local manufacturers took steps in re-establishing this industry and then made a continuous progress. Once the local government was established in the state during 1950’s there was more effort to stabilize the carpet industry in order to increase the revenue of the state. Soon the Tourism and Handicrafts centres were started to promote tourism and the Craft of the State which resulted in great income generation for the Manufacturers and various other steps were taken to promote this on a commercial platform. Slowly the process of carpet weaving was transferred to rural areas as small scale industries and lot of training programs were conducted to work on the betterment of the skills. Though initially carpet weaving was only the men’s domain, soon official agencies took steps to encourage this among the women which led to a positive development. Large Arkansas was established on a commercial scale generating employment and resulting in the creation of numerous ancillary units which were the prime recipients of subcontracted work. The making of a Kashmiri carpet is a pure art and its quality depends on the number of knots. It is usually handmade and hand knotted and is made of pure wool or pure silk whereas a low quality carpet may be a blend of wool, Cotton and Silk. The Silk Carpet is usually woven with Mulberry Silk and its quality is tested based on the number of knots it has, for 600-900 knots per square inch ranks a very high quality and durability. It takes at least 8 to 10 months for weaving of an intricate and a good quality Carpet. The fact of the Kashmiri Carpets being priced high is quite common for the amount of work and the time it involves. The magic behind the entire process of carpet weaving involves the entire family or the household sitting around a handloom throughout the day with dedication and concentration weaving magic with their fingers to convert mere silk or woolen threads into perfect designs of beautiful colors. The Silk carpets are very light when compared to that of the staple. In spite of great difficulties faced by this industry at present this traditional heritage is till given life by the weavers by giving immortal contribution from their side. They not merely weave design from their mind but it is much more than that for they weave poetry into enchanting designs and everlasting beauty. They weave carpets of different designs like 2×3, 3×5, 4×6, 6×9, 7×10, 8×10, 9×12, 10×14, 12×18, etc. The Kashmiri Carpets are India’s pride. The carpets are also used as wall hangings and in beddings. Each Carpet is designed with a symbolic meaning where tree of life is the most common design used and also the designs influence the tradition and the culture of the particular area. A parrot refers to life, a sparrow to fertility and good harvest, trees like palm trees, pear trees, and pomegranate trees represents fulfillment and blessings, Roses signify prosperity. Animals like camel denotes\ wealth and happiness, a lion represents loyalty, scenes with fighting animals on oriental carpets symbolize the eternal struggle between good and evil. The peacock, the national bird of India, denotes royalty. 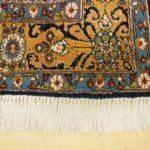 Different soft colors are also used in the manufacture where sky blue denotes Persian national color, green is a religious color for Muslims often used in prayer rugs, Red represents good virtues like joy and cheerfulness, Indigo blue represents solitude. Black color is generally avoided. 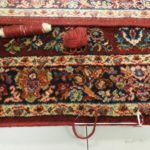 The art of Carpet weaving in Kashmir is passed from one generation to another and most of these traditional weavers prefer to hand weave the Carpets in spite of many new mechanized process which has come up. The process of Kashmiri Carpet making is quite laborious for it involves a lot of time and different steps starting right from cultivation of silk or wool, treating and dyeing it, deciding the pattern of the carpet, weaving and then adding the final touches. Nakaash is the person who designs the Carpet, a Kalimba is the weaver and the ranger is the person who Dyes the Carpet in the local Kashmiri language. In the making of the Carpet the weaver follows the Talim chart which is a coded colour chart. This chart indicates the number of knots which has to be weaved according to the panned colours. As the day starts the master weaver reads out the code and the assistants follows the instructions carefully. The colors and numbers of knots to be woven are indicated by signs. The steps carry on as the weaver chants the Talim and winds the warp around the loom. This is supposed to be a more accurate method than the graphic method. Once the Carpet takes its shape then it is preceded by the knotting and the carpet is rolled back to the loom. The final stage in carpet weaving is the washing which adds shine and glimmer. Washing is most commonly done with soap, bleaching powder and other natural chemicals. The wash is followed by sun drying and then clipping. The carpet then comes to the finishing stage which needs the hand of skilled artisans and is done piece by piece in hand knotted carpets. The radiance of the carpet is increased by constant polishing of the pile with the feet. Nowadays mercerized cotton is used in the production of the carpets and the base is usually made either from cotton or silk. The Kashmiri Carpets can be considered as a life time investment for it is hand-made. It is always prized quite high for the making of the Carpet is quite laborious and time involving. Also the raw materials used in the production are very expensive like wool and silk. A handmade Kashmir carpet ranges from anywhere between Rs. 7000 to Rs. 20,00,000 depending upon the workmanship and the material used. However nowadays the prices are curbed for the fact that the artisans these days use mercerized cotton in the making of the Carpet. Also various other unique features add to the heavy pricing of the carpet. The latest trend used in the making of the carpet is the use of mercerized cotton. However the use of computer for designing by Indian Institute of Carpet Technology ( IICT ) on software called Naqash is getting quite common for it is said to save the time and money of the artisans. The “Miras Carpet Industries” has come up with eight centers in different parts of Kashmir to impart training to the people in the field of carpet weaving. Thus now the artisans are trying to use different kinds of fabrics in carpet weaving. Innovations like “pseudo-new” designs and some quality control steps which are followed has helped in the enhancement of the industry. In spite of innumerable specialities and durability both the art and the artisans have suffered and are suffering a lot due to the fading of the art in various grounds like financial resources, lack of modern technology in dyeing and designing, production of duplicate Kashmiri carpets,etc. GH.Nabi Ganie who is known to be weaving the most Expensive Carpets in Kashmir syas that inspite of the excellent tourism of the state the survival is becoming quite difficult for the weavers mainly because of economic inflation. He complaints that it is difficult to work with Silk thread and cotton after the sunset for the electricity is very erratic. This art of weaving is practiced more in rural areas of Kashmir like Baramulla and Budgam etc districts. Apart from these places there are few colonies in and around Dal Lake and Achar Lake in Srinagar city where many artisans are associated with the weaving. However the showroom people who have shops in urban areas though they purchase at a low price they are able to sell it at exorbitant rates. So the sufferers are mostly the makers who live in the rural areas. This industry is roughly said to bring a turnover of about 650 crores strong with a majority of products worth Rs 412.45 crores exported to United States, Germany, France, United Kingdom and Gulf countries. How to wash Pashmina/Silk Pashmina shawl? Hand wash in lukewarm water using your hair shampoo. Be sure to dissolve the shampoo thorough then put the sweater into water. Rinse with hair conditioner, this would make your cashmere shawl more softer. Wash colored garments separately. Squeeze gently, do not twist or wing. Twisting the wet shawl would stretch the shape of your shawl. Dry flat after removing excess water, away from direct heat and sunlight. Press with damp cloth, using a cool iron, iron from the inside of the garment. Do not wear the same garment frequently, allow the garment two or three days’ rest after one day’s wearing. A silk scarf goes well with cashmere top and cardigan, to put it between your cashmere top/cardigan and your neck will also prevent powder or other cosmetics stains. Do not wear the garment next to rough clothing, metal necklace, bracelet, belt and rough leather such as crocodile leather bags. Dress up your cashmere with silk scarf and pearl accessories instead of accessories with rough surface. Pilling is caused by abrasion during regular use, it often develops on elbows, on the seat of skirts, and in areas rubbed by a bag or briefcase, even seat belt. Soft, fuzzy surfaces are more susceptible than others. So for cashmere and silk/cashmere, it is normal when pilling develops in some areas after times of wearing. To avoid pilling, it is important not to rub the garment with rough clothing, metal accessories, bags and all kinds of belts. In case you can not avoid the belts such as seat belts, cover your garment with a silk or synthetic fibers scarf, make sure it is the smooth surface that is next to your garment. To remove pills, just manually pick them off. Do not rub and brush the garment.